This famous blogger is someone who I met on the internets, the tubes, the interwebs, blogosphere, freakysphere, etc. Our relationship began when I answered a want ad for a photography student, but that's a story for another day. 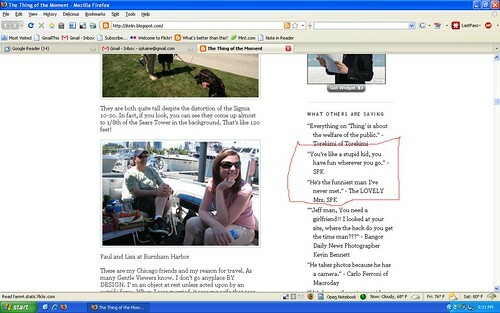 His name is jkirlin and today, my wife and I were immortalized on his blog as you can in the above picture. For this, I am eternally grateful. Becky is eternally freaked out. And the authorities are eternally prepared.